Travel 90 minutes one way by speedboat in search of these majestic sea creatures. Should luck be on your side, you could be rewarded with a sighting. 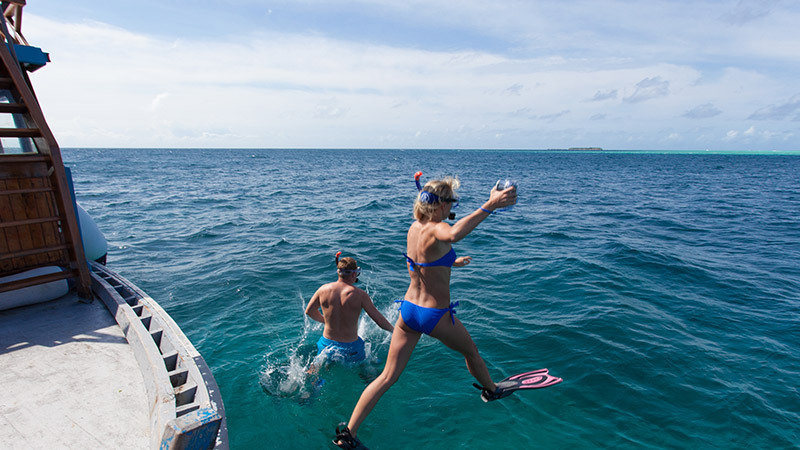 Enjoy your sighting from the water as you swim or snorkel in the company of whale sharks. An experience that is sure to take your breath away! Return to Veligandu for lunch. Snorkelling equipment is available for rent from the Dive Centre for US$10.00++ per set (fins / mask / snorkel) or for purchase from the Gift Shop. At Veligandu we believe in minimising our impact on the environment to ensure a more sustainable future. It is with this in mind that we kindly ask you to respect the ocean and not to touch the coral or any other marine creatures. Kindly also note it is illegal to collect live shells or coral. An exciting excursion for swimmers only. The trip includes water and soft drinks. Lunch is provided on the boat. This thrilling day out is for swimmers only. The trip includes water and soft drinks.